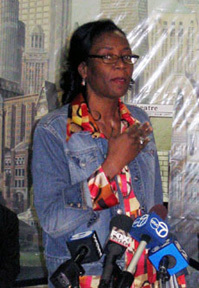 Troutman was instrumental in the succesful 2003 battle to save St. Gelasius Church in her Woodlawn community, threatening to lie down in front of bulldozers to stop demolition. That's an interesting observation. It leads one to wonder about who are the political sponsors of each of the landmarks commission members, especially the three brand new ones who recently slipped in without much fanfare. Also, the St. Gelasius church controversy is somewhat topical for this reason. 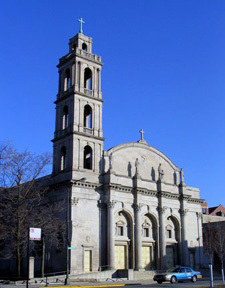 The Catholic Archdiocese advocated demolition because they said that there were no funds to repair and maintain it. The city offered no help. Interestingly, just a few days ago, it was announced that the Spertus Center, a Jewish institution on Michigan Avenue that has enough funds to build new on the most expensive land in the city, is going to receive a multi-million dollar city subsidy. The Spertus Center is not a synagouge - its a cultural center /museum- so there isn't a church/state seperation issue like there would have been with St. Gelasius. In any case anyone who believes the Archdiocese is short on clout in Chicago is deaf, dumb and blind. I would like to know- for instance- how they get away with maintaining St. Boniface in a manner worthy of Lou Wolf - while there are (and have been for years)willing buyers - including developers who would adaptively reuse the church and add it to the tax rolls.